Today is Maundy Thursday, the day Jesus celebrated Passover with his disciples one last time before being crucified the following day (Good Friday). It’s an important day for Christians, even though many denominations don’t recognize it in any way, because it was at this “Last Supper” that Jesus gave his disciples communion for the first time (Luke 22 tells the story). When I was growing up, the pastor of the United Methodist Church my family attended chose to mark each Maundy Thursday with a Passover meal at the church. The readings and service itself were very abbreviated, but all of the symbolic foods were there. I remember the stories about why we were eating these things, and what they represent, really resonating with me, even as a moody adolescent. The church we go to now doesn’t have a Maundy Thursday service, but tonight, Jason and the girls and I will go to our friends’ house in Farmer City for a Seder meal. You might suspect, being Obama fans and goyim, that we’re participating in Seder because anything the President does is suddenly all the rage. (The Obamas are hosting the first ever Seder in the White House this evening.) But this is actually the third or fourth year we’ve joined Dorie, Elie and their daughter for this most important meal of the year. I decided it is the perfect opportunity to dig a post out of the archives from two years ago. Perhaps no one in my life sums up the Halfway to Normal concept better than Dorie and Elie (“Eliezer,” if you happen to be his former Yeshiva teacher or his mother on a bad day). For starters, Dorie and Elie live in Farmer City, which is halfway to Normal, Illinois from our house. But even before Dorie and Elie moved to that literal halfway geographical location, they were halfway normal in a number of other healthy ways. One of my favorite things about them is how they conducted their relationship in an almost scientifically “backwards” fashion: they met one summer during college, got pregnant, had a baby, moved in together, got to know each other, bought a house together and moved from New Jersey to Farmer City, and then got married, five years after the baby. Elie is post-punk, Dorie’s crafty, he’s Jewish, she’s Protestant, he’s serious and earnest, she’s bubbly and fun. And it all really works. It’s Halfway to Normal at its best. For the past couple of years, Elie and Dorie have hosted Hanukkah and Seder dinners at the brick Victorian farmhouse that they’re painstakingly restoring. Jason and I were both raised in Christian families who have a lot of respect for Jewish traditions, and make a point to be more aware of how Christians and Jews are alike in our beliefs, not different. We think being able to take our kids to a “real” Jewish holiday meal is a great thing. It’s a bit surreal, though. Farmer City is a town of 2,000 people (at four years old, S asked if there was only one farmer there). There seem to be many farmers, as you might expect, but only 1.5 Jewish residents. When you’re driving into town, toward the grain elevator, humming your Jewish holiday tunes, you get the feeling you’re going to some illicit gathering of a secret society. Like maybe we should hide the car in the brush and pull the curtains before Elie dons his yamaka and lights the candles, and we drink our four large goblets of sweet red wine. We gulp most of it down before we eat much of anything besides some horseradish and matzoh, so as the night wears on, the singing of the Seder order (Kaddesh, Urechatz, Karpas, etc.) grows increasingly robust. Our kids are delighted. They can only begin to understand how normal and yet not this whole scene is. Their suspicions about their neighbors’ feelings were confirmed when one day Elie got into it with the neighbor, who claimed they hadn’t mowed the lawn recently enough. Elie, who is studying plant biology at the university, tried to explain the broader vision for their yard—that they were growing wildflowers in one part of their yard, were going to plant hostas over here, etc. The neighbor wasn’t buying it. Before retiring, he had worked for some lawn chemical company, and his yard consists of plain, very green, short grass, right up to his fence. He started accusing them off being moneyed people from the East with unconventional, fancy ideas. When things escalated, and the neighbor said he was going to report Elie, he went as far as to add that he was sure “you people have plenty of lawyers in the family.” Take that, Jewish boy. Dorie and Elie did the only thing one can do in response to such a situation. They threw a party. To be exact, it was a “Get Off My Lawn Soiree,” complete with silver script-inscribed napkins, croquet, fancy-schmancy cocktails, and a whole bunch of friends wearing formal wear. We were all as fancy as possible and had a wonderful time celebrating who Elie and Dorie are, and where they are. Whether the neighbors like it or not. My dad used to make a huge deal out of Lent, and of course specifically the week leading up to Easter. Being a pastor, he sort of made the entire community take notice of Lent. I remember Passover Seders in the basement of the Presbyterian church. That was pretty interesting. I am always surprised by Christians who simply cannot understand why another Christian would want to remember Jewish customs. I woke up thinking about what life was like for the disciples during this week we are remembering. 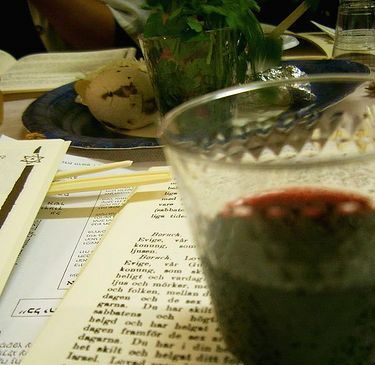 If we would recall the origins of Christ, it makes perfect sense that you would go to a seder. Even more so when you tell me about these remarkably fun people. I wish I knew them. Elie leads the Seder with gusto, the curtains open, and we protestants throw ourselves heartily into the rituals under his lead, as best as we can. We sing the songs and listen to the scriptures and stories, letting the sounds of Hebrew words wash over us in their foreign yet oddly comforting ways. Hours after we’ve begun, after the kids have hunted for and bargained with the afikomen, and we’re eating our kosher cake with strawberry-rhubarb sauce, it occurs to me how our children can only begin to understand how normal and yet not this whole scene is: one fully Jewish man leading several religious misfits and their children through an ancient ritual—the same ritual Jesus was raised with—as the moon rises above the corn and soybean fields spreading out in the dark night beyond the windows. Meagan, thanks for sharing your own story about trying to soak up a bit of the Jewish culture and tradition around you. I love that you resorted to picking up what you could through your upstairs neighbor’s floorboards on Friday nights. I’m sure it’s harder to be invited into an orthodox Jewish community, but you should definitely try to strike up a friendship with some of the moms and their kids. It’s such a rich tradition.